Krannert Art Museum is launching new student-focused programs this fall, including a Response Wall featuring an artwork addressing a current event or issue. The first artwork for the Response Wall will be a painting by U. of I. alumnus Vernon Fisher: “Man Cutting Globe,” 1992. Acrylic on paper. Gift of the Ainsley I. Graham Trust. 1994-6-2. CHAMPAIGN, Ill. — Krannert Art Museum is opening its fall season with an array of student-focused events and programs, including KAM Fest, featuring live music, giveaways and student artwork. Social events, free student membership, internships and a new volunteer program are some of the ways the museum is creating a welcoming atmosphere for students. But the most exciting way for students to be involved at KAM is through the art itself. The museum kicks off the new school year with KAM Fest on Aug. 30. Falling at the end of the U. of I. welcome week, the event will draw new and returning students, said Anne Sautman, the museum’s director of education. KAM Fest is free and open to the public. 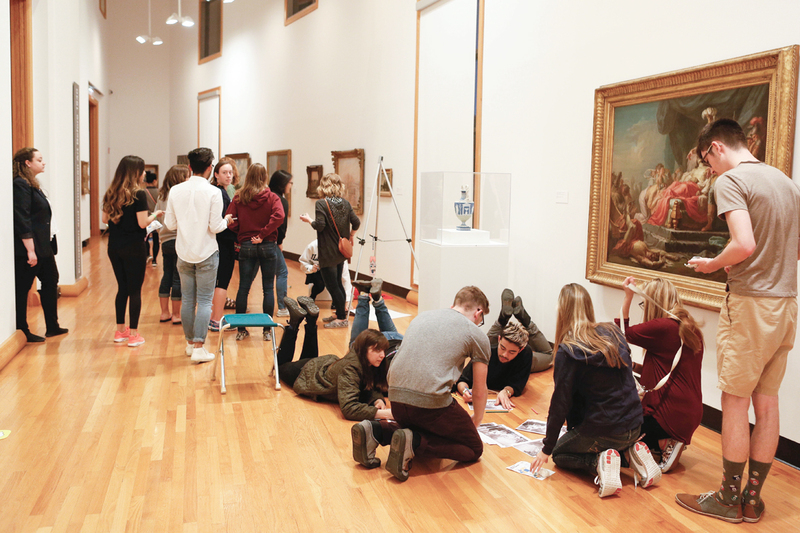 “We want students to start out seeing (the museum) as a place to have fun and see art, and to have it on their radar for the rest of the year,” Sautman said. 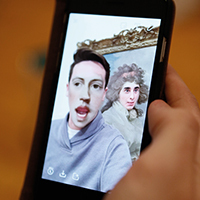 Students play Portrait Gallery Face Swap on Snapchat at the Sugar High study break event at Krannert Art Museum in 2016. Students will be able to see new art exhibitions, hear live music from local bands, eat free tacos from Maize and get a free t-shirt or tote bag at a screen-printing station run by students in the Noble Print Club. KAM Fest also will include the first Student Art Pop-Up exhibition, a one-night showcase of artwork by U. of I. students. In the past, a student membership cost $15. But membership events weren’t really targeted to younger people, Seydl said. That will change with the new program. Student member events will include some of KAM’s most popular programs, Sautman said, starting with KAM Fest and including Art Remastered, in which local musicians write and perform new songs about works of art in the museum, and student-produced events near the end of the spring semester. “We may also provide opportunities for students to talk with curators and visiting artists,” Sautman said, adding that the new membership program will take into account student ideas and feedback. Starting this year, students also will have more internship and volunteer opportunities at KAM. The museum has formalized its curatorial internship program, opening up the opportunity to work with curators on research and exhibitions, Seydl said. Students and curators will collaborate on in-depth projects that relate to their interests and the museum’s work, and students will get course credit through their academic departments. Aimee Schneider, a recent graduate and coordinator of KAM’s Giertz Education Center, is piloting a volunteer program in museum education to give students experience in the museum. In the program, students will volunteer three to four hours each month to help with school tours and educational activities for schoolchildren. They’ll organize materials and observe the teaching in the galleries, with the goal of eventually being able to teach some lessons themselves. “It’s a great chance for students to see what we do and to meet other people who share their interests,” Schneider said. 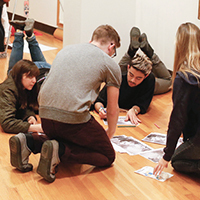 Students socialize during a coloring activity at Krannert Art Museum during finals week in 2017. Volunteers will meet monthly to talk, do prep work for museum education programs and get to know each other. These meetings will be before artist talks or museum events so the volunteers can stay and participate in the event with other students, Schneider said. 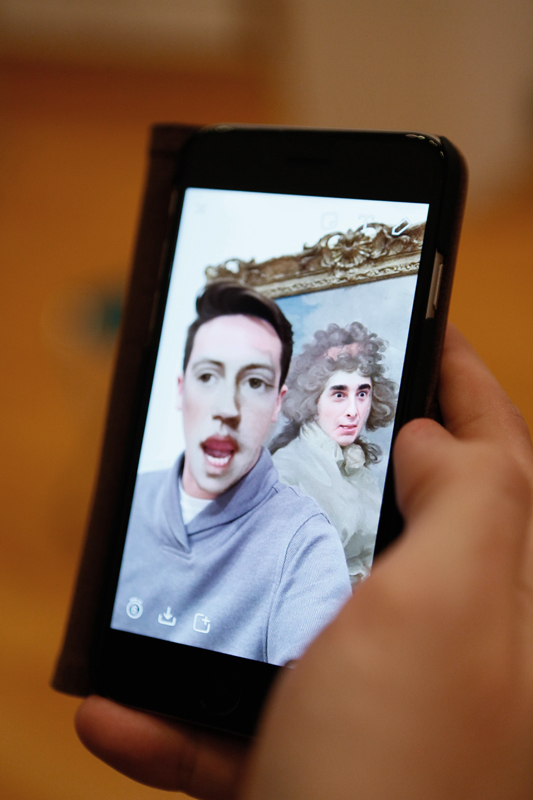 In addition to these programs, the museum is engaging students through the art on the walls – in particular, a new installation called the Response Wall, Seydl said. It will be located in a high-traffic area for students, near the lower-level auditorium. Seydl wanted to create a meaningful art experience in that space for students who come into the museum for class but may not visit the galleries. The Response Wall will feature a single artwork addressing a current event or issue. A short text will explain the work and pose open-ended questions. Visitors can use sticky notes nearby to write responses and add them to the wall alongside the artwork. The first Response Wall artwork will be “Man Cutting Globe” by Vernon Fisher, a multimedia artist and a U. of I. alumnus. 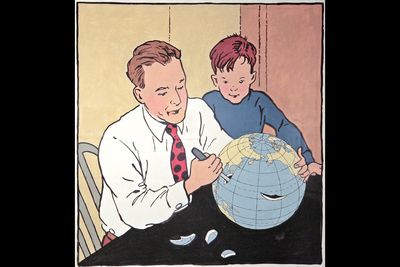 The painting depicts a father and son carving up a globe as if it’s a Halloween pumpkin. The Response Wall will ask what the work says about our place in the world and our relationship to the planet, Seydl said. Students will be encouraged to share their ideas about issues or art for future Response Wall installations. Editor’s note: For more information, contact Julia Nucci Kelly at jkell@illinois.edu.